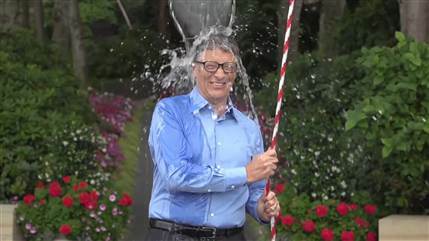 As you all likely know by now, the ALS #IceBucketChallenge is taking your Facebook news feed by storm. Your friends, colleagues, heck, even your grandmother might have been nominated to dump a bucket of cold water and ice on her head in the name of charity. And in this case, it’s a very good cause. ALS is Amyotrophic Lateral Sclerosis, also referred to as Lou Gehrig’s disease,a neurodegenerative disease characterized by muscle spasticity, rapidly progressive weakness due to muscle atrophy, and difficulty in speaking, swallowing, and breathing. As a social media consultant working with social causes and nonprofits, I have taken great delight in the virality of this meme all in the name of a disease that gets very little attention and fundraising dollars. Along with most social media memes or “viral schemes” comes the cynicism and the naysayer backlash — and I get it. I do. But the proof is in the numbers. Last year, the ALSA.org raised $1.9 million in contrast to this year’s $31.5 million, and that number is growing by the millions every day. 1Peer pressure and egoism have always been central themes in philanthropy and successful fundraising. If you’ve ever attended a nonprofit board meeting, you’ll see these two elements in play quite often and to great effect. Altruism isn’t selfless. It never has been and probably never will be. The ALS #IceBucketChallenge is no different. It’s just in your face more. 2The rise in social media has contributed to what many call, “armchair activism,” “slacktivism” or “clicktivism.” These words are pejorative terms that describe minimal effort, “feel-good” measures, in support of an issue or cause, that have little effect other than to make the person doing it feel like they have contributed. The bottom line is that “clicktivism” does build greater awareness and can be the potential first rung in the donor engagement ladder. It’s also cultivating a generation of future philanthropists and do-gooders. There’s a reason why so many of the millennial generation are going into philanthropic careers or finding ways of incorporating good works into their daily lives. I think the rise in these types of online social good campaigns that flood our news feeds have a huge part to play in this phenomenon. The ALS #IceBucketChallenge is a perfect example of this. 3Building awareness is critically important. Yes, donation dollars trump all but there’s a reason nonprofits have communications and marketing departments. These teams are charged with not only raising money online but also building awareness and community for their cause. It’s the first step in creating a consistent and renewable supporter and donor base that’s loyal and motivated. What’s your take on the ALS #IceBucketChallenge?Caroline Avakian, Socialbrite’s Managing Partner, is a global development communications strategist in the New York City area with a focus on strategic communications, technology, and innovation. Contact Caroline by email, see her profile page, visit her website, follow her on Twitter and Google Plus or leave a comment.